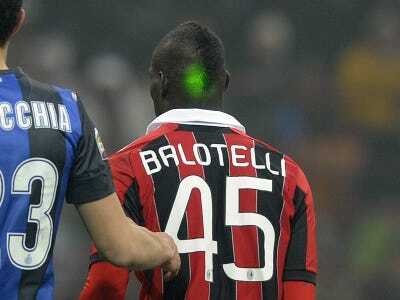 Yesterday’s rivalry game between AC Milan and Inter Milan was marred by racial abuse directed at striker Mario Balotelli. Inter fans had inflatable bananas and whistled whenever he got the ball, the AP reports. Balotelli, an Italian of Ghanaian decent, started his career at Inter before playing two years at Manchester City. He recently came back to Italy for AC Milan, and he was abused by his former fans yesterday. Inter was fined for a similar incident earlier this year, and there could be another one on the way for this.